Today I do not have one of my own poems to share, but instead, I would like to invite you to visit the book release party I just held for for EVERY DAY BIRDS. The birthday for this, my second book, was on Tuesday evening, February 23, and here is you can see some pictures from the event. I wish that you could all have been there, but here's a window into our little celebration here in East Aurora, New York. If you would like to see more about the book, you can do so at my website or on Tuesday's Poem Farm post where I am also giving away three copies of the book to commenters. Simply leave a comment (on that post, not this one) by tonight (Friday, February 26), and I will announce the three winners on Saturday. Now, the best way to celebrate is to invite guests, right? I am so pleased to welcome second grade teacher Juliette Awua-Kyeremanten and her students from Lincoln Community School in Accra, Ghana - West Africa. My new friends had sent me some of their Valentine's poems earlier this month, and last week, I asked them about the birds they see outside their windows in Accra, the capital city of Ghana. 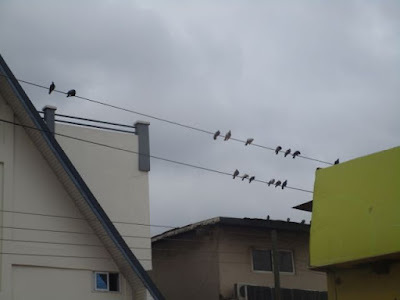 To my happy surprise, this class generously responded with a congratulations note about EVERY DAY BIRDS, two photos of pigeons on wires that Ms. Awua-Kyeremanten had taken for her own writing inspiration, and a group poem about birds that live so very far away from where I live. Some are the same, but some are quite different. I am now thinking about what fun it would be to connect this class of young writers with another class of young writers - perhaps on a joint bird research project? Hmmm....I am getting some ideas. Thank you very much to these students and their teacher for sharing their daily birds with us! What birds do you see outside your window? Today I am tickled to visit my dear friend Irene's blog for her birthday! Visit Live Your Poem to have a piece of cheesecake with Irene, to hear a little bit more about EVERY DAY BIRDS, and to read a beautiful poem by the birthday girl. This month I am grateful to host Jenna Kersten over at my other blog, Sharing Our Notebooks. If you have not done so, don't miss reading about how Jenna keeps her notebooks. And there's a giveaway over there too, for a great book about writing. Liz is hosting today's Poetry Friday roundup over at Elizabeth Steinglass. All are welcome to come on by to check out this week's poetry offerings. Love seeing the pictures of your party, Amy. Congratulation again on your beautiful book. What a treat to hear about the birds in Africa too! What a fun party! I wish I had been there. How great to invite the birds to join you. 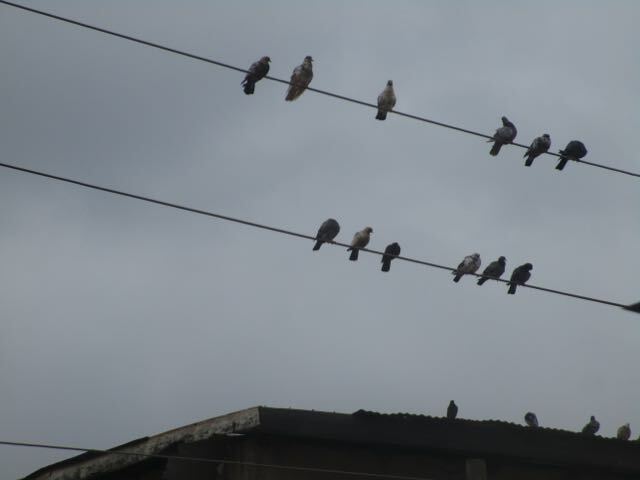 Thanks too to Ms. Awua-Kyeremanten's class in Accra for sharing their backyard birds. Congratulations on your new book, Amy! I have a friend who is also a writer in the town next door who used to work for the Audubon Society and would love it! Congratulations, Amy! Such fun to have seen this a part of this book tour, the Dublin phase! I wish I could have attended! It looked so fun, and I would have loved to have met all of the birds, especially Jimini Crowket :). Congrats, Amy!! Congratulations, Amy! Every Day Birds is every bit as lovely as I knew it would be! Thank you for sharing the photos from your fun party. And what fun to learn about "Birds in Ghana" from second graders! There is something about birds that fascinates. I'm watching blue jays this very minute! Congratulations, Amy on another book! I'm putting it and Irene's on my "wish list" to buy for the grandkids. I think I'll soon be known as the "book grandma" as that is my go-to gift, especially since I have virtual friendships with so many fine poets! 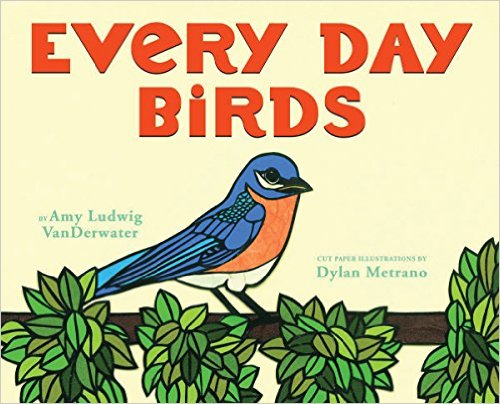 Wouldn't that be wonderful to hear from school children all over the world about their every day birds! Thanks for sharing the photos and poem from Ms. Awua-Kyeremanten's class.